My first stop on my Cali adventure was Belly Good Café & Crepes in San Francisco. This hidden little gem is found in a tiny mall and had a lineup around the block. We honestly stood in line for over 30 minutes, but it was well worth it. These desserts are not for the faint of heart, as I barely ate half of it. 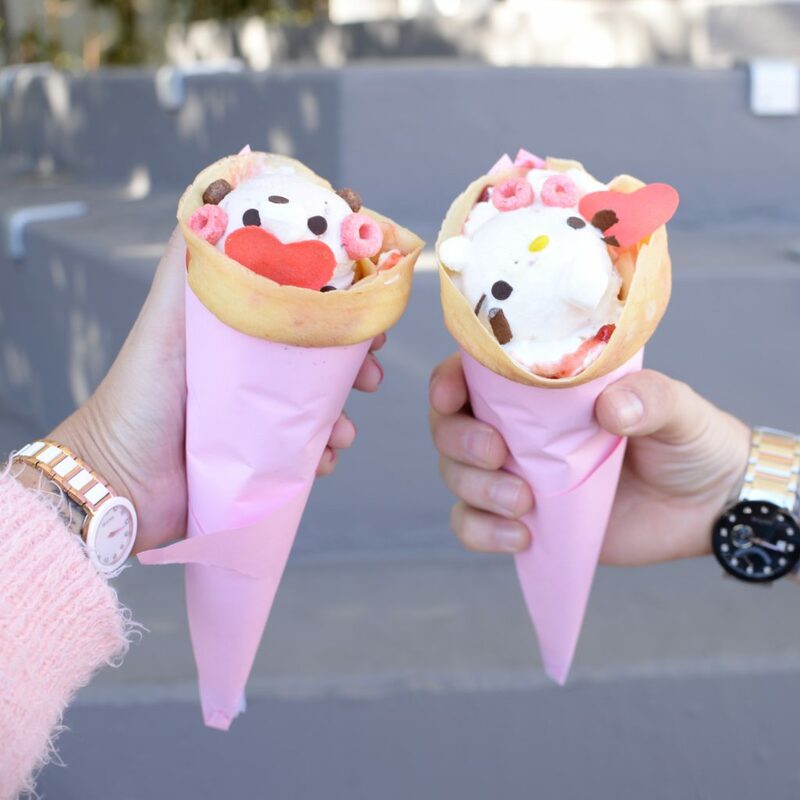 Not only are these crepes filled with ice cream, whipped cream, chocolate, marshmallows, syrup of your choice, but are then sweetened up even more in cute cat, bear and monster faces. 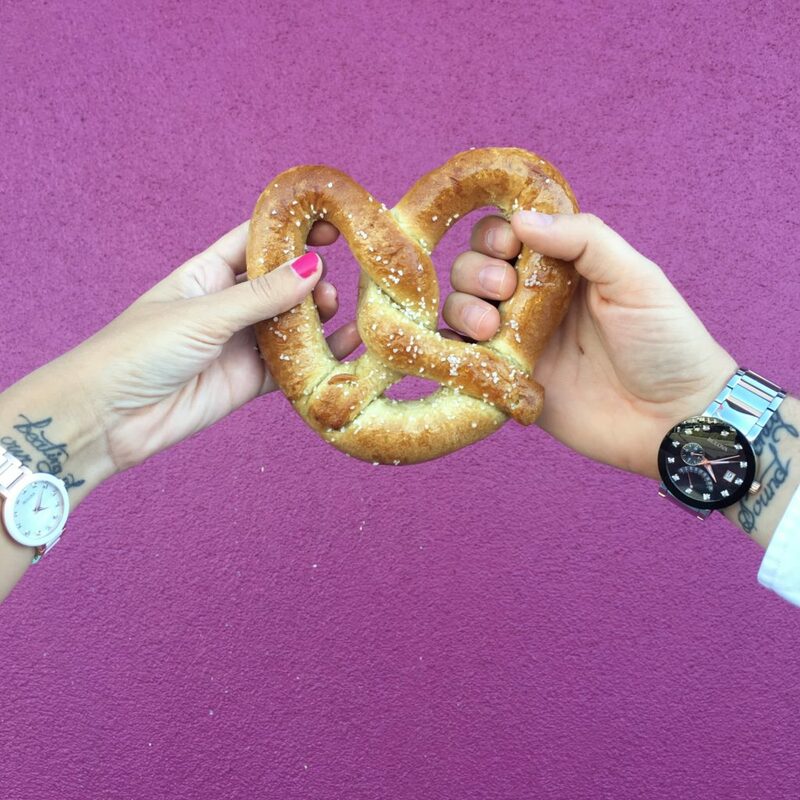 Working your way down the coast, be sure to stop by the Santa Cruz Beach Boardwalk for the best pretzel of your life. A great fresh, soft pretzel is one of the most delicious foods in existence. This one was served hot out of the oven and into my waiting hands. Its warm and buttery flavour was perfectly topped with sea salt for an oh-so delicious taste. You haven’t had grilled cheese until you visit Chomp Eatery & Juice Station in Santa Monica. They are known for their Unicorn Melts and unlike any other unicorn or rainbow dish you’ve tried in the past. 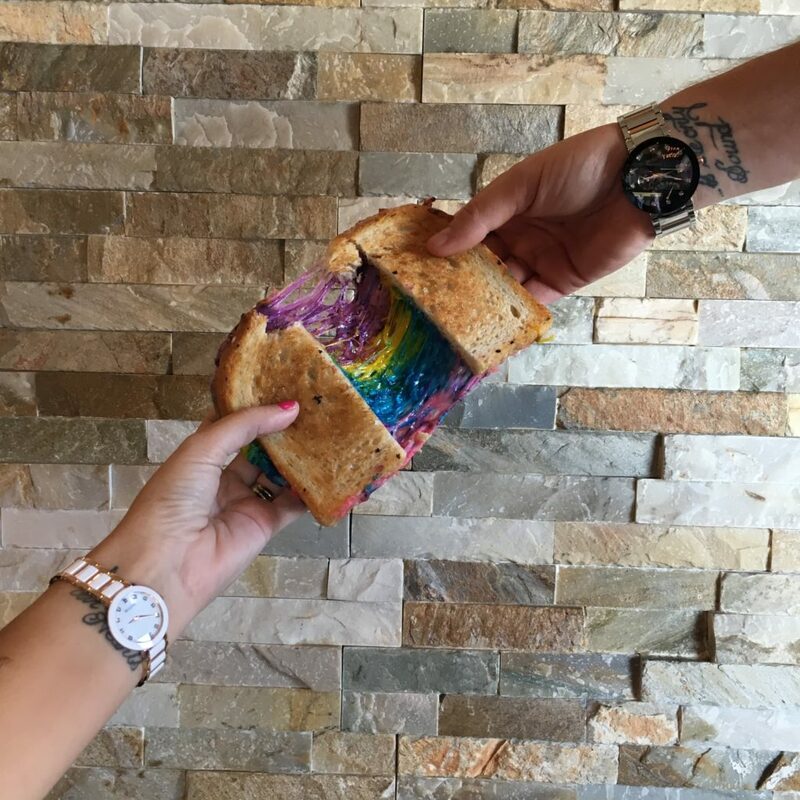 This multicolored sandwich is made with white American and provolone cheese, with a sprinkle of magic food colouring that gives it all the mermaid vibes. It comes on toasted sourdough bread that almost melts in your mouth. Not only is it mouth-watering good, there’s no denying it’s quiet satisfying pulling it apart and seeing the rainbow inside. At only $6, I felt like I was robbing them blind. Although Venice Beach may be famous for their boardwalk and funky, offbeat vibe, people also lineup for their freshly squeezed lemonade. There’s nothing like a cool, refreshing drink on a hot, sunny day which is why people rely on acidic drinks to cool them down. 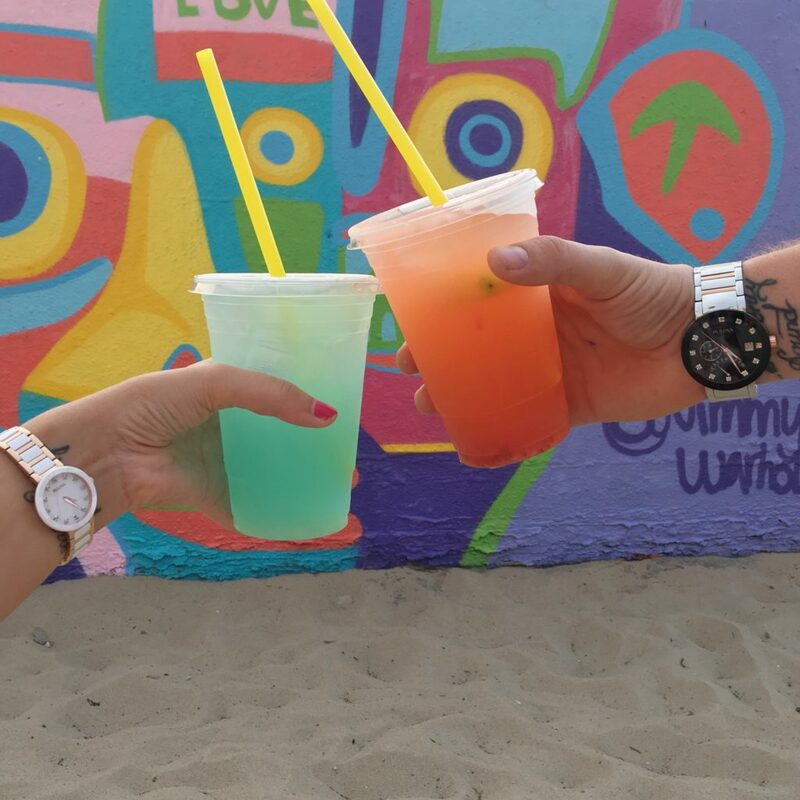 From strawberry, watermelon and blueberry, the boardwalk features an array of vendors serving up this classic drink. It wasn’t too tart, nor was it too sweet or watery, just thirst-quenching goodness. 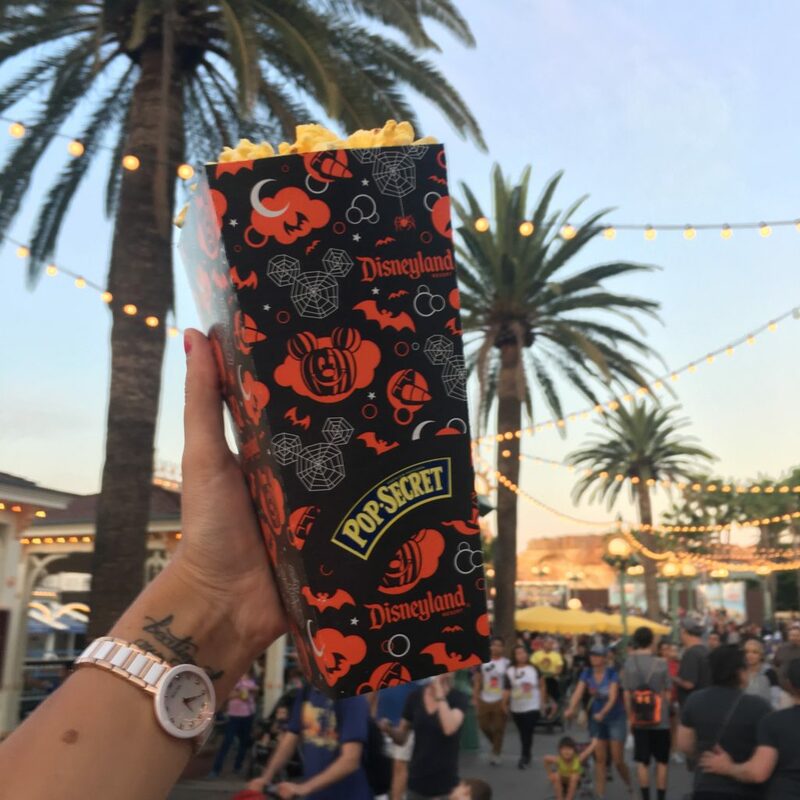 Often people go to Disneyland for the rides, to meet characters and to pick up some cool merch, I go for the food. From churros, Mickey macarons, turkey legs, frozen yogurt and beyond, it really is the happiest place on Earth. I’m not sure what they put in their popcorn, but it was addicting. There’s something magical about their popcorn that can’t be matched to any microwaveable stuff you make at home. There was something nostalgic about it, it brought back childhood memories and left me wanting more. 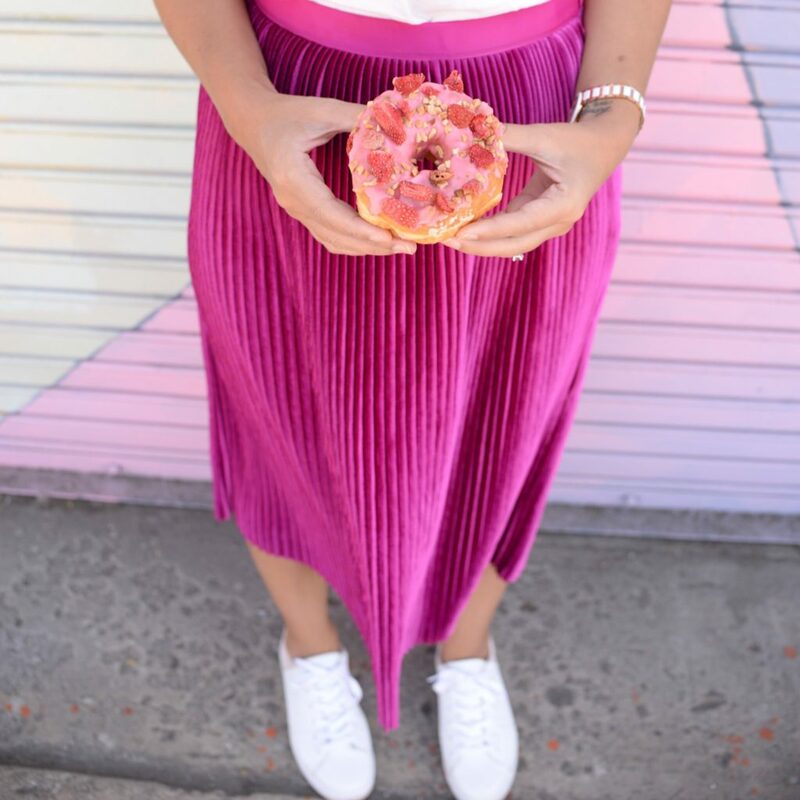 LA is known for their donuts, but California Donut’s is so popular and busy, they stay open 24/7. There’s not a lot to say about this place, besides it’s amazing. They offer a wide variety of freshly baked goods that’s oh-so instagramable. From Oreo pandas, to Lucky Charms, to Strawberry Nuts and Froot Loops, this mini chain always has a lineup and is dominating the donut world.